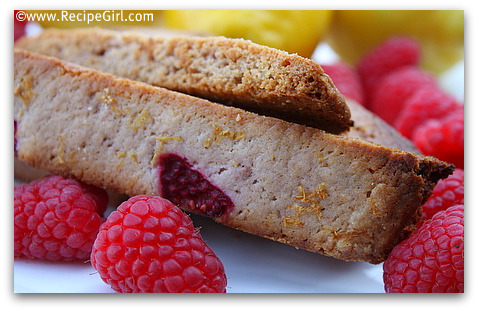 I made a different version of this recipe once before… wasn’t too impressed with the flavors, but I loved the idea of a raspberry/lemon biscotti. 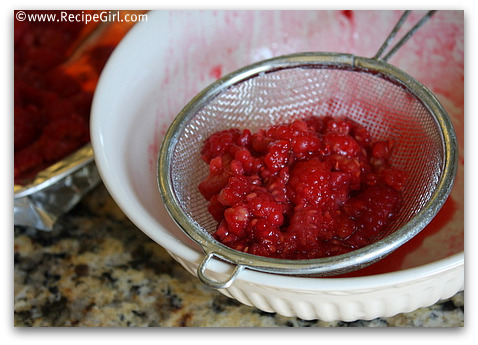 When I came upon a bounty of raspberries this summer, I found myself awake in the middle of the night thinking about this recipe again. (Everyone has that problem, right? Unable to sleep because you can’t get an idea for a recipe out of your head?) The problem with the original recipe was that the raspberry flavor really didn’t come through very well. But one sleepness night, the solution came to me: roast the raspberries. Since roasting vegetables seems to bring out the best in them, why not try fruit as well? So I tossed my raspberries in a small amount of sugar and canola oil & roasted them (just a little) until they were soft and fragrant. Roasting the raspberries with sugar brought out some of the juices, so I let them drain while I prepared the biscotti dough. I incorporated the roasted raspberries (not the juice), two heaping teaspoonfuls of lemon zest and a 1/4 cup of raspberry jam into the dough. 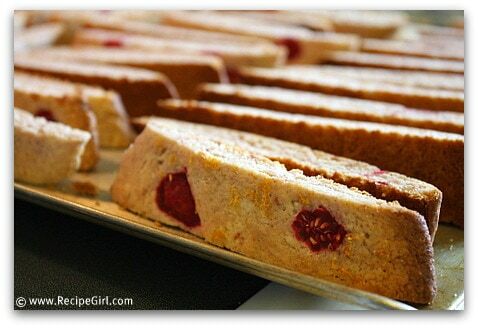 I then took pieces of fresh raspberry and pressed them randomly into the top of the biscotti logs, and sprinkled more fresh lemon zest on top too. If you’ve never made biscotti, it’s quite the laborious process. The logs are baked, then taken out of the oven and sliced. The sliced biscotti are then baked again on one side and then the other until they are finally crisp and perfect. This recipe makes a lot- about 48 biscotti, so be prepared to wrap them up and give a few away. So, was the sleepless night worth it? YES! I’m happy to report that these were full of raspberry flavor with a hint of lemon too. I’m not sure if roasting the raspberries did the trick or not, but it certainly was a different way to go about it. Biscotti recipe saved! Oh.. this just looks divine on some many levels.. I have to get back to baking again… = ) you are my inspiration. What a great idea. They sound great! Incredible! I love those flavors together. I’m a huge fan of biscotti. Your sleepless night was so worth it! I pay a lot of attention and importance to the texture of any food, and this must have been soo good! 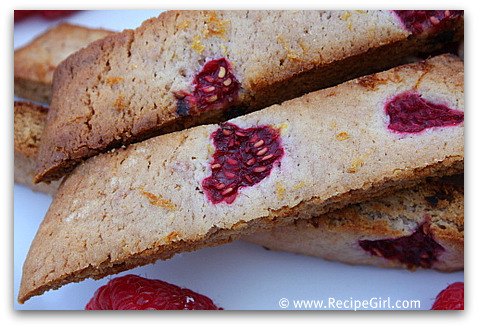 The crunchy biscotti, with the soft raspberry! WOW!! I love biscotti but doubt I will ever make them. Wish you had given them away to me! I agree roasting just about anything enhances the flavors- I’ve done it with rasberries, strawberries, blueberries and blackberries and poured the result over a meringue and ice cream. The fruit flavors knocked me out. You give them away? I don’t make biscotti but if someone gives them to me, I put them in a baggie in the freezer and pull them out one at a time and eat them as is (they’re not really frozen, just crunchier). 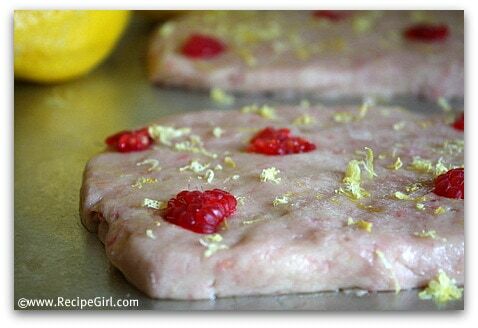 Love the idea of raspberries and lemon and they look wonderful. What a cool biscotti flavor, it sounds so good! I roasted strawberries once and wasn’t a huge fan, but maybe I’ll try again with raspberries. What a great idea for a biscotti flavour!!! These look phenomenal! I don’t usually seek out biscotti but this recipe has changed my mind. Raspberry and lemon is one of my favorite flavor combos! So creative to roast the berries. Kudos! Roasting raspberries? You are one creative baking genius. The biscotti look delightful! Such a scrumptious variation of biscotti! !